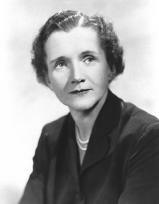 Through her books, Rachel Carson focused attention on marine life and on the dangers of chemical pollution. By educating a wide audience about contaminant hazards, she helped lay the groundwork for the environmental movement. English and become a writer. A course in biology rekindled her interest in science and led her to change to a science major. SEE ALSO Environmental Movement, Role of Water in the .